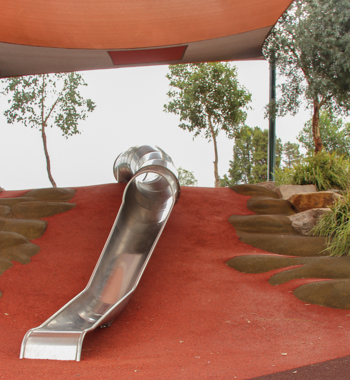 Located away from the main traffic through-routes, on the corner of Hope and Durham streets in Bathurst, this dinosaur-themed adventure playground on a large lot incorporates unique elements in its design. We parked easily alongside the kerb, and the girls’ imaginative games were only interrupted by the fascinating arrival and departure of a helicopter from the nearby hospital. 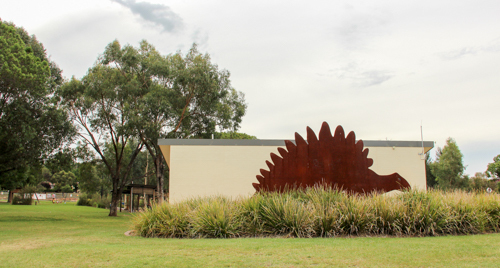 A metal stegosaurus hides in the grass near the amenities-block, serving as the only signpost for this fabulous playground. 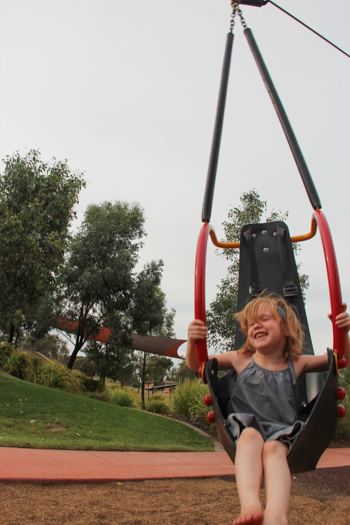 Four years after the playground's construction, the gardens have matured and complement the equipment nicely. 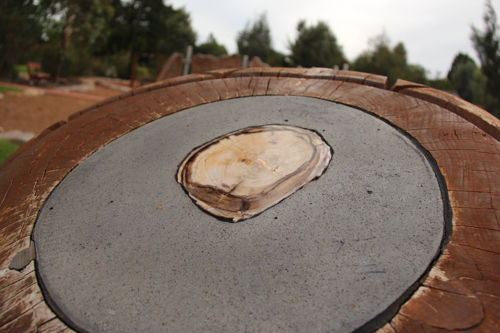 Petrified wood is incorporated into the fossil sculptures. 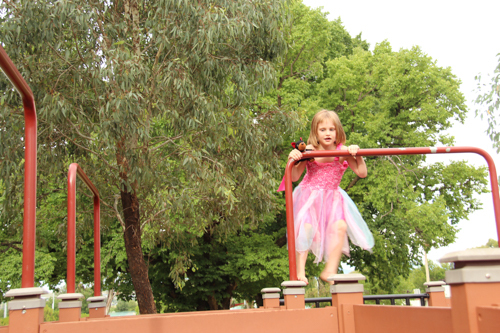 I heard about Bathurst’s Adventure Playground soon after we visited the region in 2011. I was disappointed for the girls’ sakes that we hadn’t known about it, but there’s a definite advantage in visiting a playground four years after its construction. 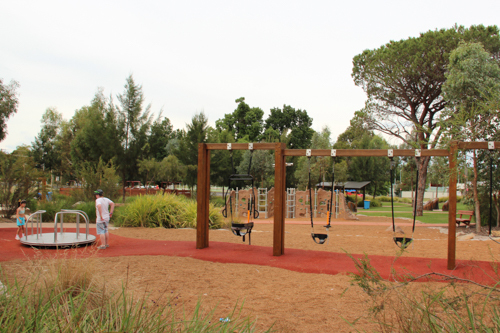 The gardens have grown around the equipment and the overall effect makes the different playspaces more compartmentalised. Flat stones lead through the long grass. 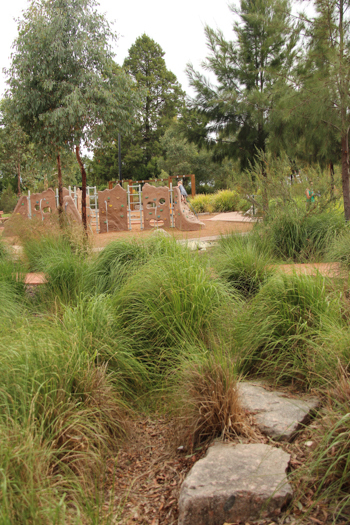 The different textures at play in this park demonstrate how effective plant-choice can be in playground design. The dinosaur theme is repeated often within the design, and it’s well-incorporated. 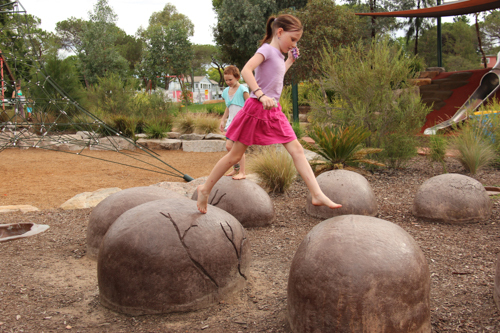 Some of the elements (such as the fossilised wood) are more subtle, but statues, bones and eggs easily encourage imaginative play among children. 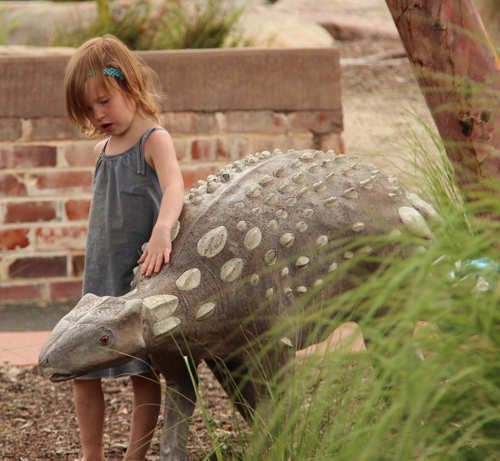 Lana pauses to greet the resident (correct-me-if-I'm-wrong) anklyosaurus. 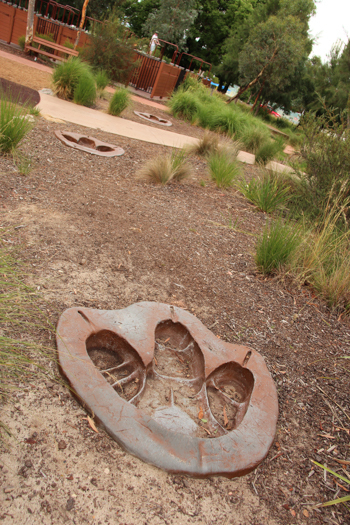 Huge dinosaur footprints lead across the playground. 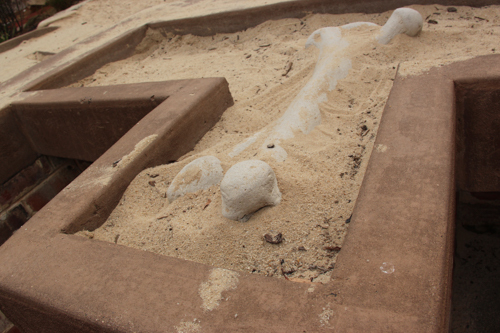 A large bone is hidden in the sand-pit. A clutch of dinosaur eggs sit to the side of the large climbing web. The use of more sublte colours helps the equipment blend into the landscape. Everything is earthy tones, and after last playing among the brilliant colours of the Hunter Valley Gardens, this is a more peaceful place to play. We're visiting on a cloudy day and so can't fully analyse this complex sundial, but Calista's happy enough to jump from block to block! 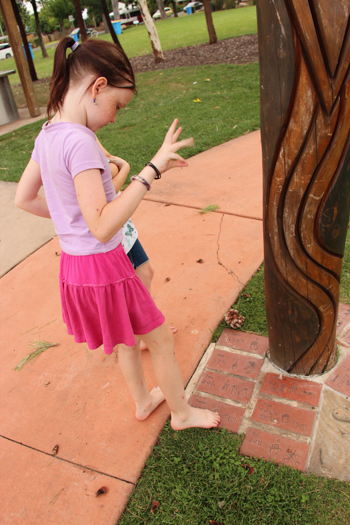 Aisha copies the sign-language pictographs engraved in the pavers at her feet. 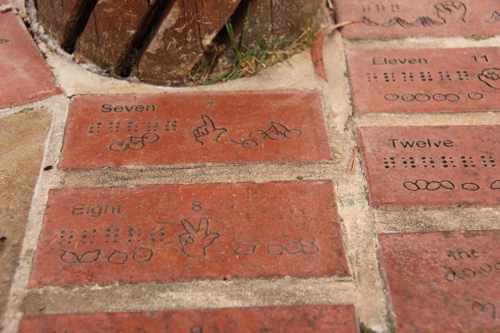 Numbers (and further along the path — common words) are spelled out in English, Braille, sign-language and pictures. 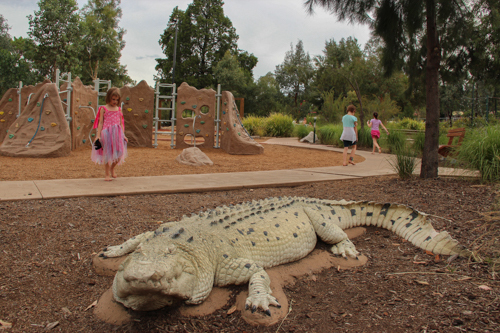 A large crocodile lays in wait alongside the rock-climbing walls. A short bridge incorporates bell-tones of specific notes. If you're nimble and quick, you may be able to play a tune! A slide this height is called a super-slide, but with so many other interesting features in the playground, it can't really compete. A dual flying-fox offers a full seat option as well as the usual circle-seat design. The standard playground is included in the design. A small playground off to one side offers the usual plastic equipment and serves as an over-flow playspace for busy times. 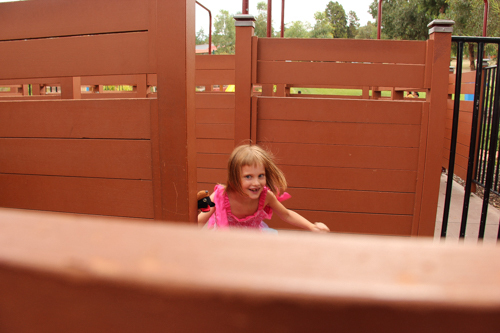 A corral of fences are a simple labyrinth and the perfect place for a high-paced game of chase. 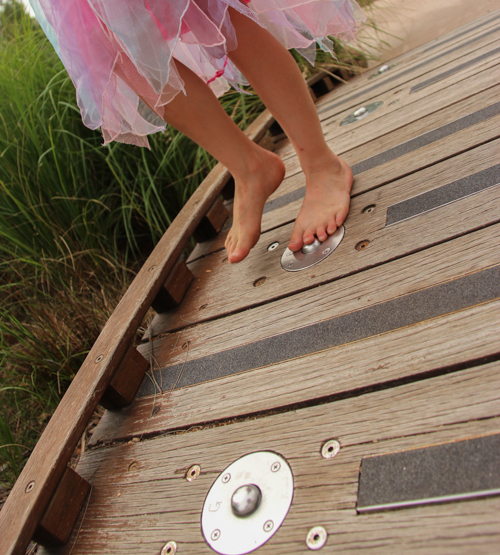 I'm impressed that the designers have integrated features which encourage children to climb the fences for a new perspective on the maze. There's a construction site happening at the top of the block. 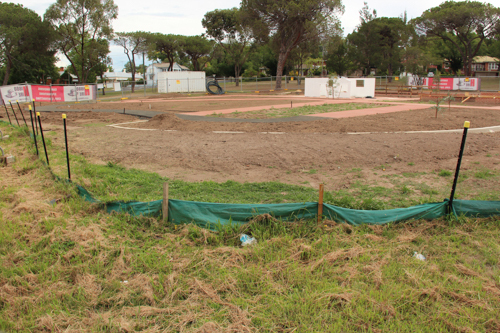 It looks like it'll be a cycling circuit for littlies which will turn this block into an even better attraction. As an adventure playground, this collection of equipment, props and plants works really well. 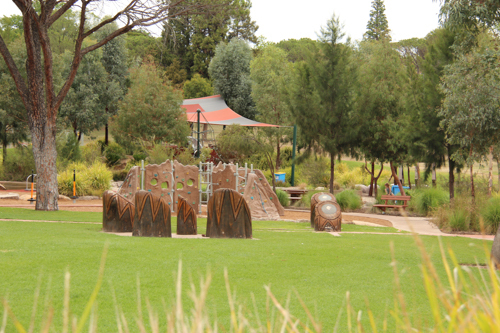 Electric barbecues, picnic shelters and water-faucets are scattered around the perimeter of the playground, making it an ideal location for a party or picnic. Any travelling families who pass through Bathurst should definitely make this a stop on their itinerary. Their kids will remember this playground for years to come! We travel through Bathurst all the time and I had no idea this was there, it’s a shame my daughter is now probably too old to enjoy this properly but I think I’ll definitely check it out the next time we’re there.